May 12, 2015, 68.18% of the share capital was represented. All proposals of the board of directors were approved by a clear majority. The annual general meeting approved the annual report, the annual financial statements, the consolidated 2014 financial statements and the distribution of a gross dividend of CHF 2.75 per nominal share. The dividend will be distributed on May 20, 2015. The assembly granted discharge to all members of the board of directors and the members of the executive board for financial year 2014. 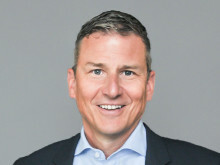 Thomas E. Kern, a Swiss national, and Pamela Knapp, a German citizen, were elected as new members of the board of directors. Hans-Peter Strodel did not stand for re-election due to the statutory age limit. All other members of the board of directors were re-elected for another one-year term of office. 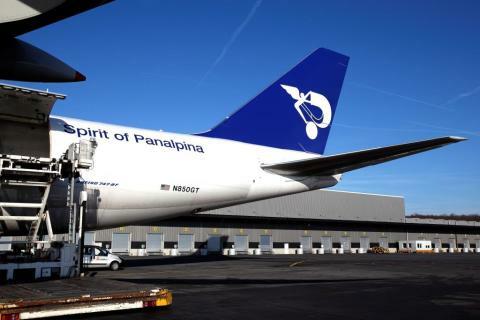 Panalpina’s board of directors now consists of eight members. In an advisory vote, the assembly endorsed the 2014 compensation report. The proposed maximum compensation of the board of directors up until the 2016 annual general meeting and of the executive board for financial year 2016 was likewise approved. The compensation committee and the independent proxy were elected as proposed by the board of directors. Finally, KPMG AG, Zurich, was re-elected as statutory auditor for financial year 2015. The next annual general meeting is scheduled for May 10, 2016. 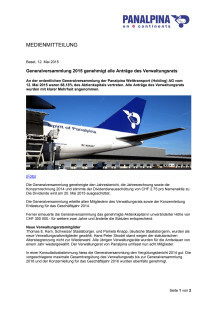 An der ordentlichen Generalversammlung der Panalpina Welttransport (Holding) AG vom 12. Mai 2015 waren 68,18% des Aktienkapitals vertreten. Alle Anträge des Verwaltungsrats wurden mit klarer Mehrheit angenommen.